This is a Prey Gear Article. In this article you will learn specific information about the Artax Propulsion item you will find on Talos 1. 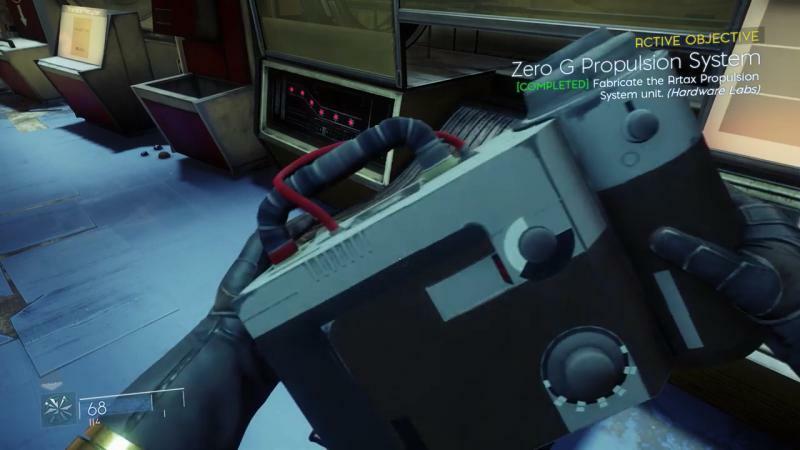 Prey being an “open-station video game,” many areas are quite explorable. Interior areas can be looted and explored, and it’s up to the player to determine what they want to do. However, for those with an appetite for spacewalk, the Artax propulsion system enables their player character to explore the exterior of Talos-1. You can craft this item from any material fabricator. This tool is very important, since it gives you access and mobility in the void of space. The artax propulsion system has to be fabricated, sure, but first you have to find the Artax Propulsion System plans. In the second floor of the Machine shop in Hardware Labs, You’ll find the fabrication plans for the Artax. It’s on the table facing the storage room.